Launched in May 2018, the new Junior Academy aims to work more closely with the Dundee United Professional Academy in giving players with high potential the chance to progress. The New “Academy” replaces the old J League and Young Tangerines sessions with a brand new curriculum being developed as well as an aim to forge links with the local grassroots boys and girls clubs in the area. 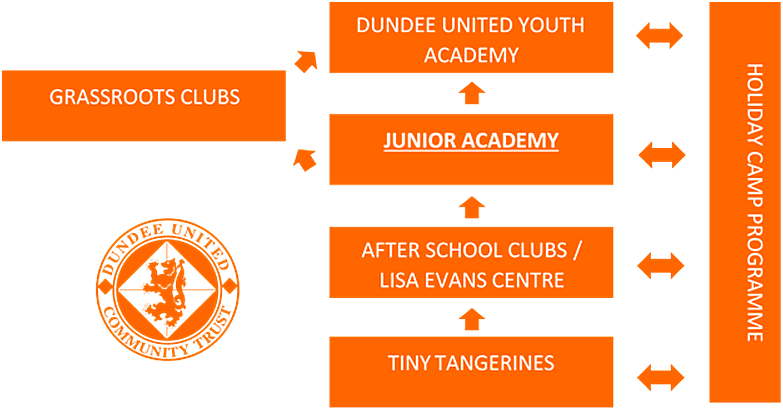 Our new Junior Academy Curriculum is themed along the same principles as the Dundee United Youth Academy. The skills we teach are important for all footballers – regardless of ability – and for those with potential to progress into academy football. We provide an environment that prepares them where creativity and flair are encouraged. Beyond football, we teach the importance of decision making and communication as well as building confidence – all of which are transferable skills which are useful in other areas of life. Creativity: Encouraged to find their own solutions. Can they see a pass no-one else does? The above shows what TANNADICE means for us and our new curriculum aims to develop players that learn to love the game through these principles.